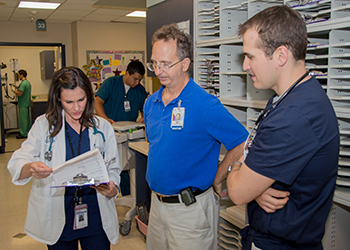 The Core Sub-Internship (sub-I) is a fourth year clinical rotation taken in one of 5 core clinical disciplines: internal medicine, general surgery, pediatrics, obstetrics/gynecology, or family and community medicine. It serves as an experience which helps prepare students for residency by allowing them to function with increased responsibility compared to third-year clerkship rotations. The student in a sub-internship should function at the level of a traditional intern or post-graduate year 1 (PGY-1) learner. Students are required to take at least one 4-week sub-internship during their fourth year in a core discipline to meet graduation requirements. This rotation must be taken with a University of Arizona faculty preceptor. The following are general criteria by which a rotation will qualify as a core sub-I. These criteria serve to distinguish a sub-I from a third or fourth year clerkship rotation or a general fourth year elective rotation. Core discipline (internal medicine, general surgery, pediatrics, obstetrics/gynecology, or family and community medicine). Level of responsibility similar to an intern (PGY-1). Responsible for an increased patient load. Typically caring for patients of higher acuity. Ability to manage patients at a higher level (time management, increased independence [within supervision], complexity). Must involve on-call or after hours experience, initial patient assessments and management plans. Generally should be an inpatient patient care rotation. If primarily an ambulatory experience, should include some emergency department, urgent care and/or ICU coverage (similar to typical PGY-1 schedule). Although Core Sub-Internship goals and objectives will be specialty specific, these will serve as general guidelines to designate a rotation as a valid sub-I. These rotations must be four weeks in length. Of note, students may, and likely will, take sub-internship level electives in non-core disciplines during their fourth year, but these rotations will not count toward the core sub-I requirement.